A UK satire/spoof film based on key and detailed facts around Stalin’s death. A better than first rate cast and a riotous, and semi-obscene, script. There is very little that is factually untrue – although these characters may have been worse in reality. The film is quite explicit that the greatest leader in the world and great democrat was as rough as a badger’s bottom and a thousand times more blood-soaked. His cabinet were no better and I’m sure all dictators surround themselves with identikits. Egypt would know something about this. It’s a comedic attack on the madness and evil of dictatorships and the moral corruption that always goes with dictatorships. The director did the memorable, anarchic and semi pornographic (not quite) BBC TV political series ‘The Thick of It’ about how rotten Westminster was. Available in a broken way on YouTube. Interviews with the actors: mixed. They distort one anecdote about a Jewish concert pianist, Yudina, whose playing Stalin liked. She loathed him, had converted to Christianity, lived a poverty stricken life, was fired and cast out because of her very public views and gave all her money away to people in need. Stalin knew all of this yet it is said he died in his bed listening to a record of her playing Mozart. Unlike the overwhelming number of Russians she stood her ground, defied authority and lived to tell the tale. She was a very fine pianist – amongst the very few female pianists in ‘equal opportunity’ Russia – currently unchanged in this regard. What I like about Stalin generally is that he exposed at the time the gullible and delusional. Huge swathes of the left intelligentsia, particularly in the UK, loved him and ignored clear evidence of his appalling crimes (possibly 20,000,000 of his own people killed) and ruined economy. George Bernard Shaw, Harold Laski, Hobsbawm, all the Cambridge Spies and the Queen’s Keeper of Pictures and hundreds of others including the heads of Oxbridge Colleges. Most didn’t get out of Communism after 1956 nor 1968. Its also true than many UK leaders, 13 Dukes and intellectuals were deluded by Hitler – until he started shooting at them. Odd how many are seduced by ‘Great Leaders’. If its any consolation the left in France, Italy and Greece were even more deluded – as they usually were and are. Between ’39 and ’41 many leftists did what Moscow told them – support our ally Hitler. Others, particularly the French elite and intellectuals collaborated with Germany and should have been tried and convicted/executed in their thousands. Everywhere people wanted great strong despots. Nasser didn’t meet Stalin but when he embraced Russia as his closest friend he would have known of Khrushchev’s ’56 speech where the monstrous crimes were announced. I guess Nasser didn’t care or reflect that he was collaborating with a blood bath of a country and maybe that was part of the communism he embraced. 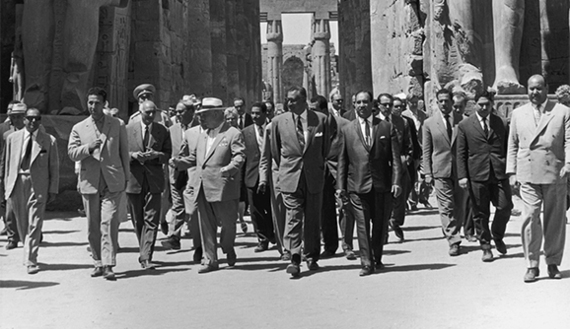 Here are the 2 great peacemakers and freedom loving leaders in ’64 at Luxor. Do any world leaders visit Luxor nowadays? One point in the movie of use to the Egyptian leadership. Fear works and spectacular and bloody isolated events control millions because most are prepared to be slaves/collaborate – providing they are fed and housed. But I guess they know that after 70 years. The problem is whether Egypt has ever delivered on food, housing and jobs. Difficult for most dictatorships. Its been screened in Saudi and got a brief but very well written positive review. I guess Saudi and Egypt are ships passing in the night and not just on money. Lets hope Egypt doesn’t sink. http://www.arabnews.com/node/1295661/lifestyle The Jordanian reviews are very positive and it screened at the Dubai film festival (but not at the World’s Greatest Film Festival in Cairo) where the electricity works, the toilets flush and the Supreme Censors exist only in Egypt. They however found the language strong – which it is. Screenings in Lebanon are at multiple cinemas and in Israel its on everywhere. India is screening it because they love film and have a long tradition of free speech and satire – unlike richer and ‘civilized’ others. In poor Kenya long reviews make it clear they see it as a valuable metaphor for Trump. The largest Muslim country in the world, Indonesia, which had 50 years of corrupt and brutal military dictatorship of infallible and magisterial idiots, likes it. Its screening in Cyprus but to empty cinemas because they don’t offer free spew buckets or condom machines – or free alcohol. Its interesting that if something is good it will go all over the world (but not in Russia) – a little bit like Egyptian films – that is before 1952. Not every country has the humanity to produce something for the world and when did a Russian movie ever go all over the world? I think I’m right in saying it hasn’t screened in Egypt – although its slapstick style would appeal to locals – particularly ordinary people. Maybe one of the expelled Egyptian film directors will do a similar one on Mubarak, Nasser and another, and survive. When death dies, SUPER Death takes over.. The fuel pipeline supplying Upper Egypt with octane exploded Sunday morning for the second time in less than a week. People in the nearby area rushed to the scene to fill their jerricans.